This guide has been created to help staff to setup their own classes for Edublogs and also show how to better manage classes and student blogs. 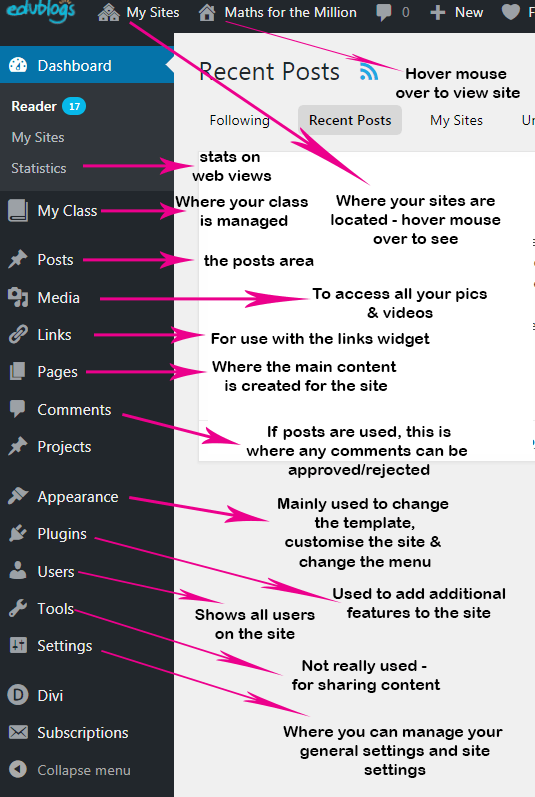 A class is a means by which staff can view every student blog from a particular module all in one space. It can be setup with specific permissions, which control whether or not students can see other student blogs. It also means that the teacher does not need student login information or any passwords to be able to see content, so security of information is ensured. A standard class will look something like this once it has been created and students have added their blogs. In future, staff should have the required skills to be able to do this themselves and this guide forms part of the how-to process. You will be redirected to another page and you should see a screenshot like the one below. Click on the link after ‘The site …. is yours.’ The site will then be created and once created you will automatically be sent to the dashboard for the site. ‘Allow search engines to index this site’ – not recommended whilst the students are at university. It may be that students will want the option after leaving university to allow Google to index the site, if they have a portfolio to show potential employers. ‘Discourage search engines from indexing this site’ – Although Google will not list the site on its search engine, it will be available for external visitor to visit the website if they have the website link. 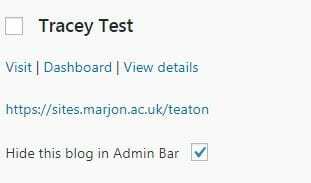 ‘Only registered users of Plymouth Marjon University Sites network can view this site’ – Only users that have signed up through the Marjon institutional login process will be able to view the blog. This means that any student or member of staff registered will be able to see the content if they have the blog link. ‘Only someone who provides the following password can view this site’ – The Ronseal option. 14. Set any specific permissions for access to things like ‘Switching Themes’ (usually this is set to ‘Allow’ – but you may have had a specific template created especially for the module, so in this case uncheck this option. 18. Go back to the Class via ‘My Class’ > Settings. 20. Scroll down the page and check any additional teachers and then Save. Students will be asked to follow the below process to join your class – this is just for information purposes to show you what they do. The class enables your tutor to access all your blog work, so it is important that you join the class. If you look to the top of the screen you’ll see ‘My Sites’ – hovering your mouse over this will reveal your new site, but if in the future you are subscribed to numerous sites or you create more – all these sites will also appear in the drop-down list. This can get confusing, so keep this in mind. If you are already a user on numerous sites, then it’s likely that the drop-down list of sites is long and if you are a user on more than 20 sites, then you will not be able to see all the sites. To access all your sites, just click on the link at the top of the drop-down list ‘See All’ or click on the three houses icon. This will take you to pages of your sites. Here you can opt to hide any old sites that you no longer need access to from the drop-down menu. If you hide any blogs remember to ‘Save Changes’ before moving on to another page. If you find this method above problematic, you may want to review a previous blog post about managing your sites, with instructions on how to create lists to help you manage Edublogs. There are many additional options, as above. For example if a student has added the wrong blog to your class, you can ‘Remove Blog from Class’ – then they will be able to add the correct blog. Note: Students can only join one class at a time, they can’t join numerous classes. Sometimes on occasion, you may visit a student’s blog and find that there is no content or have difficulty finding it. In this case, you can visit the student’s dashboard or go directly into their pages/posts. So, if I wanted to view the 6 pages above, I would just click on them. This way you can view any content you need to. If you need to check the permissions for privacy for the class, or for example you want to lower the level or privacy after the students have had their blogs marked for the purposes of reflection so the students see each other’s blogs – you can do this via the settings. This will enable you to alter the settings as required. 2. Search for the member of staff (if you use Google Chrome, when you start typing a name it should automatically appear – if you use Internet Explorer most likely it will not do this) – or find the staff email address and type it into the search box. 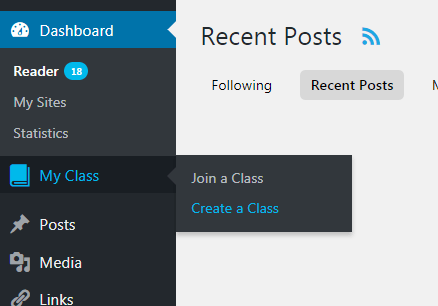 If you wish, you can create reports on the class activity, this can be done to show all activity relating to all the student blogs, including posts, comments and users. You can only set it to extract data monthly. You can download any data as a PDF or CSV file for use in a spreadsheet. This could be useful if you want to see when content was saved. For example, if a student was able to upload their blog before the deadline. You can filter the date column to display the most recent items.